Some of the most attractive members of the Bromeliad group are the Aechmea, these are epiphytic plants from rainforest areas of South America. Aechmea bromeliads and are fairly easy to grow, species such as A. fasciata, recurvata, blanchetiana and others are grown for both the foliage and colourful flowers. In many species a star shaped rossette of leaves surrounds a ‘central tank’ which holds water. 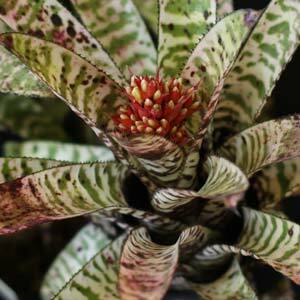 An interesting species, ranging from quite small to some of the largest bromeliades of all. Nearly all Aechmea have thorns or prickles and they are monocarpic, they flower after a number of years and then die. However, by this time they will have produced offsets, so life goes on. Aechmea can do well as indoor plants. A moist humus rich growing medium is best, bright indirect light and some warmth. A. blanchetiana- this is sun lover, large foliage orange as it matures. In shad e the foliage will be a green colour. A. gamosepla – Also known as the matchstick plant because of the flowers. A.mexicana – Very attractive mid green foliage, excellent for creating a tropical foliage look in the garden or in a container. A. recurvata -Narrow curved and upright foliage. Cultivars are also available including Aechmea gamospera ‘Lucky Stripe’ (picture right) is the variegated matchstick plant is a hardy plant when grown indoors or outdoors in a protected position. 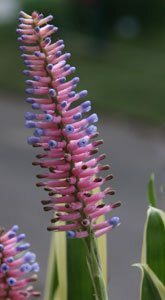 Aechmea can be grown outdoors in warmer climates, in cooler areas they do require a little extra care and are usually grown in pots indoors. Although Aechmea require good light they do not like strong direct light. Basic care revolves around warmth and keeping the tank filled with clean water. Watering is essential during summer, however over winter you can hold back on the water a little. You must use a free draining potting mix as they do not like to sit in water. Propagation by removing the offsets or pups is easy, simply take some roots with them and replant, wait until the pups are around 1/3 to 1/2 the size of the parent. Can be divided every 3 – 4 years. Try a little 1/4 strength liquid seaweed fertiliser once a month in the growing period.